There are some authors who, despite your best intentions, seem to linger upon the to-be-read shelf forever. For me, Erik Larson is one of those authors - I've had a trade paperback edition of The Devil in the White City sitting on that fateful shelf for far too many years now. When I came across the ARC of Dead Wake: The Last Crossing of the Lusitania, I knew this would finally be our chance to connect, especially given my fascination with shipwrecks and submarines. This is a lengthy, detailed, in-depth narrative exploration of historic events. As such, the pacing (at least at first glance) seems a little odd - it takes 140 pages for the Lusitania to leave port, and 250 pages for it to begin sinking. The story is almost Dickensian in the way Larson spends so many pages talking about minor characters and their stories, but that's part of its appeal. It's those passengers, crew, politicians, and more who bring the Lusitania to life, who humanize the tragedy, and who make us care about a ship that sank 100 years ago. If you thought you knew the story of the Lusitania - sunk by a German U-boat, propelling the US into WWII - then prepare to be surprised. There were so many circumstances and events on both sides of the Atlantic that set the stage for such a tragedy that it's sometimes hard to believe. If this were a fictional novel, few would ever buy into the sequence of coincidences, and even fewer would ever believe that officials could be so obtuse and callous in their decisions. If there's such a thing as destiny, then the Lusitania was certainly destined to sink. It's a story that casts an uncomfortable shadow on people like President Wilson and Winston Churchill, and an equally uncomfortable sort of light on the German U-boat commanders. It humanizes everyone, makes you regret the weaknesses and distractions of the 'good' guys, and makes you sympathize (at least a little) with some of the 'bad' guys. Dead Wake: The Last Crossing of the Lusitania is a story that vindicates Captain William Thomas Turner, a man who was excessively demonized and portrayed as an incompetent coward in order to isolate officials from blame, and to protect state secrets. It all comes back to those callous decisions. Had they released just one piece of precious information, given Turner just one single line of advice or warning, nearly 1200 lives would unquestionably been saved. It's not just a matter of "what if?" but more a matter of "if only." It's also a story that casts some doubt on history's portrayal of Captain Walther Schwieger as a cold-blooded murder, letting us experience the tragedy from his unique perspective at the periscope. Larson is unquestionably fair in his portrayal of the German U-boat captain, putting blame squarely on his shoulders, but also allowing some cracks to show in his stoic exterior - especially as he watches the silent catastrophe from beneath the water, and then chooses to silently turn for home, rather than fire a second shot. While it's a long time coming, the actual sinking of the Lusitania is as chilling for the circumstances as for the behavior of the passengers. Larson shows us faces of unimaginable calm in the face of impending danger, with casual conversations and lazy movements contrasted against the speed with which the ship listed and sank. There's so much 'prim and proper' going on that it'd comical, were we not already aware of their fates. At the same time, he puts us right into the heart of chaos and confusion, with heartbreaking scenes of horror and tragedy - such as when a passenger forces a lifeboat to be prematurely launched, crushing the passenger and drowning those on board. It's an experience even darker than that of the Titanic sinking, with passengers worried not just about the cold and the water, but also terrified that the U-boat might still be within range to begin shooting survivors. 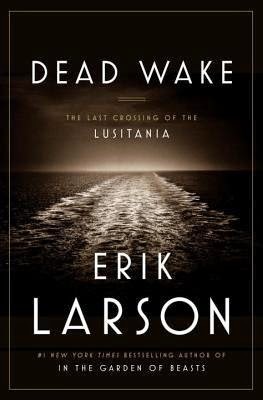 Utterly fascinating, and more than a little sickening to realize how much could (and should) have been done to save so many lives Dead Wake: The Last Crossing of the Lusitania is a must-read for history buffs and literary fiction lovers alike. They say truth is stranger than fiction, and the sad tale of this great ocean liner proves that once again.